What are my blogging goals for this year? Well, maybe not YOU specifically, but the Finish the Sentence Friday gals did. 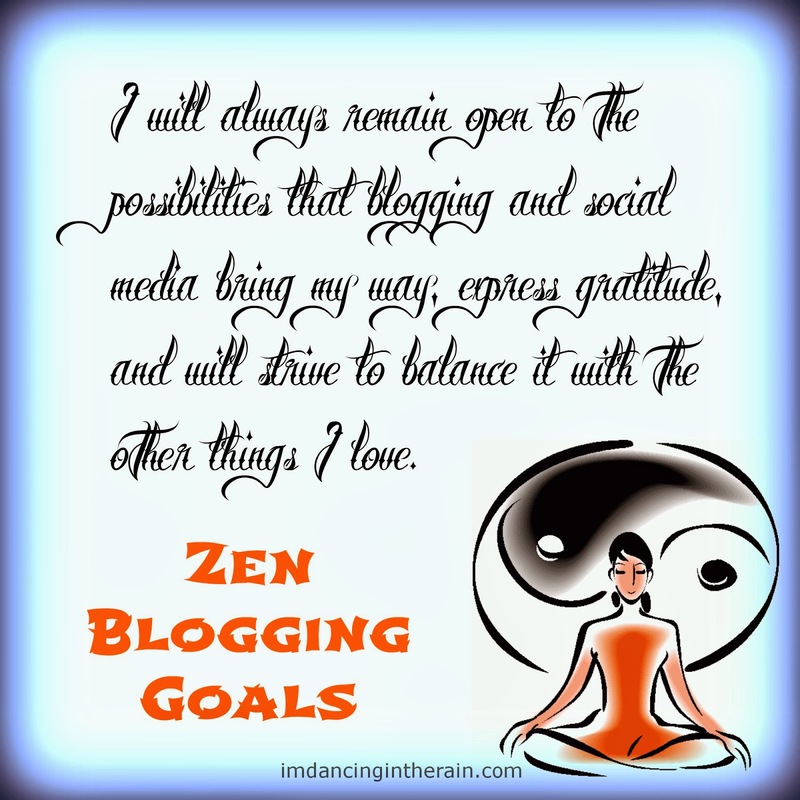 I'm not sure if I can say I have hard and fast GOALS because I take a very Zen approach to my blogging. I do what feels right at the time. I don't have some calculated strategy to try and become some big time, famous capital-B Blogger. Sure, I want to do it well, I don't dislike making a little money through blogging. I want to be liked, I enjoy writing about my life (it is very therapeutic) and of course I love the interactions with others. Now that I've been at it awhile, I've become quite compelled to be a voice for others like me, loved ones of those with chronic illness. I have yet to find another blogger who is the spouse of someone with complicated health problems, nor have I met one who is visually impaired like me. I know I have a unique perspective to draw on and share, and that's the biggest reason I love blogging. Each of us does, in some way, and that's why I love other blogs too. So, no "I'll be working hard towards this" goals, per se, but I do have a few things that have been bouncing around in my head. I renamed my blog from just JENNIFER to Dancing in the Rain in October. That was a pretty big task because it involved changing my URL, creating new visual elements for EVERYTHING, updating links across all social media channels and creating a new Facebook page and bugging people to like it. But it was totally worth it. I felt such a sense of relief, actually, when it was done. There's something unsettling about a piece of you not being the correct representation OF YOU, if you know what I mean. A lot of "blogging advice" I've read mentions having a newsletter option, so I've thought about that. I want to keep The View From Here guest post series going for at least a year. Wanna help me out? Go HERE. I've also been thinking about wanting to have a conversation about the definition of a caregiver. I feel that someone in my situation is overlooked as such, and therefor not given the kind of support they might need. I want to write about it, and see if it will open people's minds a bit. I want to write a post about how my MIL got my husband diagnosed with diabetes when he was nine. She came up against a stubborn doctor and had to fight for what her son needed. I'll probably be writing more about my daughter's school situation, as things arise. My son's 8th birthday is this month, and I want to share his school portrait and ask him the same interview questions I asked Camryn last fall. I will most definitely be blogging about hitting the ripe old age of 40 in April! I guess you could say my goal is to keep blogging about my life! Isn't that the whole point, anyway? Beyond all that, I will always remain open to the possibilities that blogging and social media bring my way, express gratitude, and will strive to balance it with the other things I love. Next, I need to post about my word for 2014!